In collaboration, BBCW ANZ and New Zealand Mint offer this stunning 1oz gold coin to celebrate Doctor Who’s 50th anniversary. This coin is issued by New Zealand Mint as legal tender under the authority of Niue Island. The 50th Anniversary Doctor Who 1 oz Silver coin experienced a significant international response from Doctor Who Fans around the world, when it was recently released in June 2013. This Limited Edition Doctor Who 1 oz Gold coin is set to be a highly sought after collectible, with a very exclusive mintage of only 250 coins. The coin’s reverse depicts an engraved relief of the iconic TARDIS used by the Doctor to travel through space and time. The coins border features the finely engraved words DOCTOR WHO 50TH ANNIVERSARY 1963 – 2013. The coin’s obverse features the Ian Rank-Broadley effigy of Her Majesty Queen Elizabeth II. 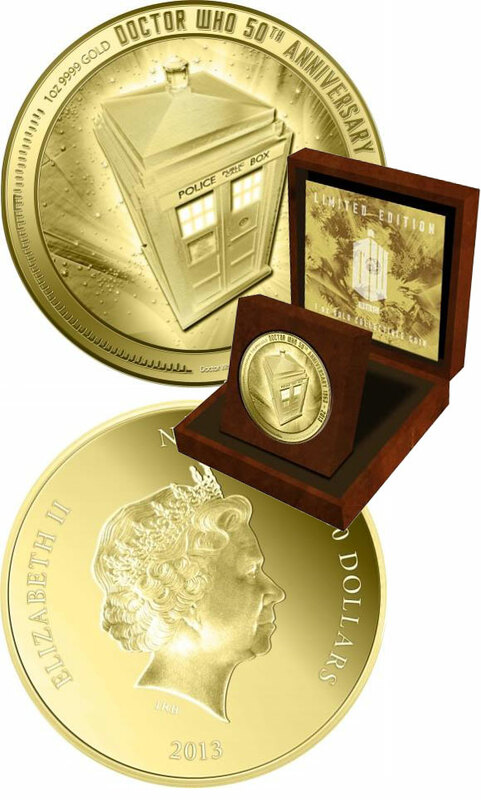 This Limited Edition 50th Anniversary Doctor Who 1 oz Gold coin is presented in a Deluxe, wooden coin case. The 1 oz Gold coin can be displayed using the elevating coin insert. A Gold foiled Certificate of Authenticity is displayed inside the case. How much would it be in the uk? They are available in the UK but they don’t ship worldwide until the end of the month. Wish they would do a UK one.